Why Deaf People Fear Not To Report Police Brutality – …And the Truth Shall Set You Free. From Nancy Rourke’s painting description: dominant colors in painting are black, blue, and white. some red and yellow. Foreground shows a male presenting figure laying on the ground/back facing viewer. His hands are taped together with blue crisscrossing tape. His hands are signing “help” behind his back. 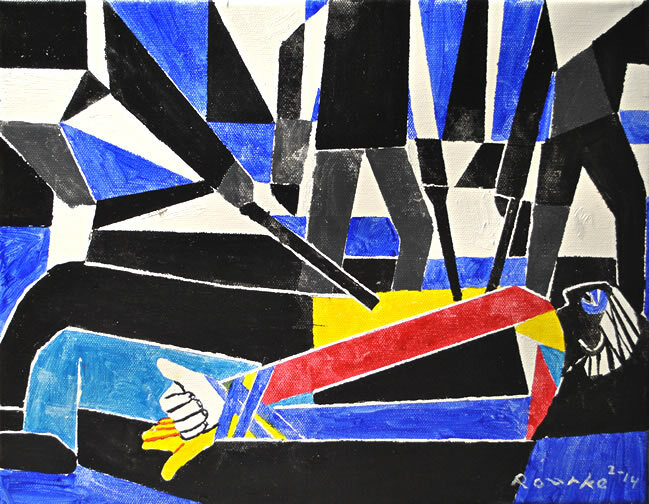 in the background are shard-like images, somewhat abstract- there are three figures holding baton sticks (pointing the sticks at the man laying on the ground). This painting is about the Deaf people get beaten and killed by police officers. In the painting, a Deaf person is on the ground, beaten by three police officers. His eyes are bruised. His hands are tied behind the back. The sign says, “HELP!” The Deaf get beaten for not obeying orders because they cannot hear. Think of this way. “The road does not stop a bird“, a Ghanaian proverb meaning change or adaptability and we the Deaf need to change the system that includes legal system, too. Yes, Deaf people deal with amygdala and post traumatic stress disorder (PTSD) for the rest of their life because they are invisible. Amygdala is an almond-sized area in brain. You see, it was found in the same level to the eyes. Not only that, but it also controls emotions such as fear, scare, anger, hate, the laundry list of words. For example, when you are really frightened, you may become shocked temporarily due to amygdala turn its normal size greater. The size of amygdala when scared would be a grapefruit and imagine how big amygdala as a grapefruit in your brain. Now, there are many Deaf people who experienced police brutality including two cases in many days apart, in their worst cases, amygdala in Deaf people takes much longer to heal and move forward. Police looks at American Language Sign (ASL) as a weapon and because of Deaf people are unable to reduce for some time. Police does not know or train to break their cultural tradition, refusing to have eye contacts in ASL. Even if Deaf people cannot lip read, the police consider them “uncooperative” and beat them down to the core. In all, the extraordinary emotion was unthinkable. The pain from the beginning to the end may make Deaf people realize and analyze many of their reflections. Now if all the police who has done to Deaf people and is allowed to escape punishment for what they has done to Deaf people in the past and present, they will make sure Deaf citizens suffer for their own pleasure. The police brutality was a poor school for human intellect and heart. Strength is a lot harder to regain than people really can understand. All those police brutality against Deaf people cannot be ignored. “When you see an old bone on the highway, remember it was once covered with flesh”–Haiti quote.